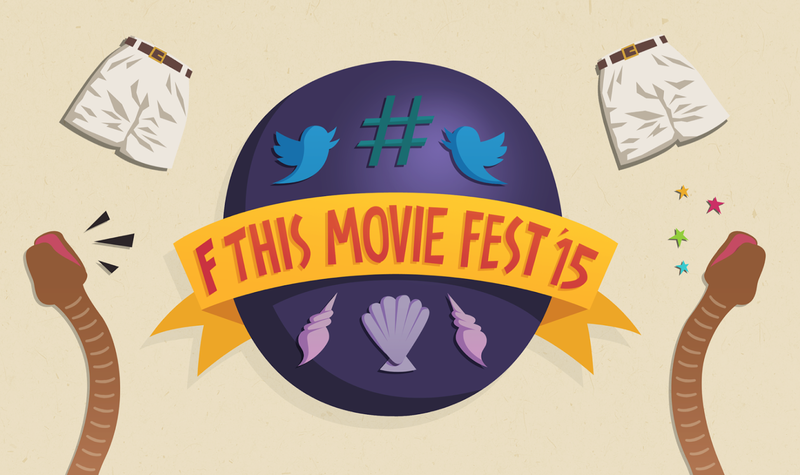 Hold onto your butts as we recap F This Movie Fest 4, our annual all-Twitter film festival! Great podcast for helping with post Ffest comedown. Be patient, this ep doesn't really punch the snake until the dinosaur impressions. ^^^ No kidding, those dino sound effects nearly killed my eardrums (listening in headphones). Yay, more women on the podcast! :-) So happy that Rik's artwork got picked, he was too shy about submitting it to Patrick but me and others pushed on Rik to send it. This will make his day. :-) The only think missing on the drawing is a direct reference to "Army of Darkness" but it's one neat piece of artwork, don't ya think? After a super successful FTMF, we need some FTMF superlatives. Luckily, I have you covered. Thanks for an incredibly fun time, everyone! Thanks for the mention, John Murphy! And I really think you're on to something here... if we could lobby to get "Best Snake Punching Scene" recognized as an official Academy Awards(R) Category, imagine how many movies would include snake punching scenes! Indeed. Not to mention it would be a reason to actually watch the Academy Awards. I'll get to work on drawing up a petition to add the category. This is awesome John. The only change I'd make is True Romance for best score. Btw, my favorite tweet was from Aaron Fors: "when a movie goes from boring crap to amazeballs, that moment will now be referred to as punching the snake." I nominate for the FTM glossary. Thanks! And I second that nomination. I picked Hard Target for the music because I loved how oddly out of place some of it felt, yet that I found it oddly enjoyable. Sweet guitar riffs meets a country bar for the win! Sadly I didn't stick around much for True Romance, so you might be right. Dammit you're right. And how can I put Zimmer's marimbas over a John Williams score? Ok. 3-way tie between Hard Target, True Romance, and JP. Congratulations on another successful FThis Movie Fest! I'm sorry I didn't get to play this year, but I'm looking forward to the recap podcast. This site is special and I appreciate all the contributors and my fellow fans. (even LA Doug) Era Greta Job! Sorry it must be the cough syrup. I meant era great job! Congratulations on another great fest and thanks for all the hard work you folds did in putting it together and promoting it! And thanks for introducing me to the sheer insanity that is Hard Target. Broken Arrow does NOT have a John Travolta problem, I will have you know. Would you mind not shooting at the ther-mo-noo-clee-ar weapons? Great fun and podcast. Im glad Heath came to join the party. Its great fun hearing you all together. Its a pity I did not last till the end. The timeshift killed me. The fest was great fun. F is for worldwide Family. This was the first #fthismoviefest that I was able to participate in tweeting about all the movies. It was hard not to fall into the trap of watching the movie and not tweeting. I enjoyed all the movies. My wife also got to see "True Romance" for the first time. The worst part is waiting until next year. Great podcast guys I will never fall asleep again must have supply of energy drinks! I really had the best time withyou all,you're the best. Great show for a great day guys! And wow, those dinosaur noises - impressive! And always a treat to hear from Jan and Erika - more of them please! Amazing to see how much this thing has grown - I'm guessing there were probably only - what? Maybe 20 people outside of the actual crew that first one? Felt like hundreds this time! And great lineup - absolutely perfect - those first few movies when you're eager to tweet (in between licking off Ketchup Doritos fingers - gross) required just the right amount of attention. Then True Romance offered a nice little break to just sit back and enjoy and maybe let out a few tweets of appreciation before ramping up for the grand finale with something most of us have seen dozens of times and can have some fun with again. Well done! Good roundtable on the movies of FthisMovieFest4. My wife and I look forward to this ever year. Just like the Super Bowl and such events. Patrick I get your love for True Romance. It is hard to put into words. I have seen the theatrical release many times. I watched the director’s cut this time. Those were three powerful additional Alabama minutes. I love it even more now. One quibble. The audio had a big dynamic range. One mic with many people at different volumes is hard to pull off. Not a big problem, I can adjust for this. The dinosaurs were great, but very loud with headphones. Maybe a little warning at the beginning of the podcast? Ok, let’s put the quibbler back in the cage. Thanks to the FthisMovie team. Looking forward to next year. A great selection of movies guys and its a crying shame I wasnt able to do but a quick cameo (I was in Australia at the time and internet was finicky for this guy). As a way to do the fest in spirit I got my own selection of movies to watch on my United Airlines flight from Sydney Australia back to Los Angeles and heres a quick review of the movies I watched with the note that I was limited to what was on United's movie selection. Men Women & Children- Internet Bad- do not go on internet OR Jason Reitman what happened to the jokes in your movies? Ratatouille- Like a fine dish gets better and better with age, I love this damn movie. Teenage Mutant Ninja Turtles (2014)- Ok Michaelangelo is a pervert and I cant tell whats going on um go ninja go ninja go?